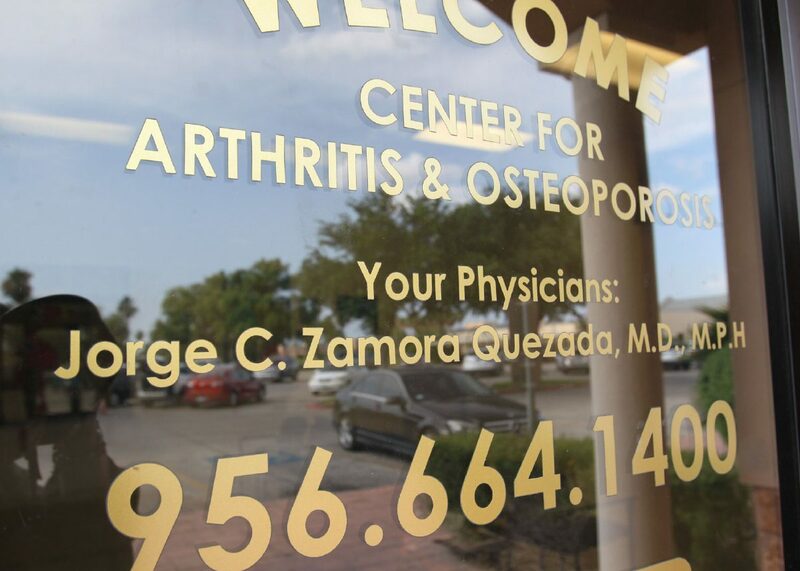 The offices of Jorge C. Zamora Quezada at the Center for Arthritis & Osteoporosis Monday, May 14, 2018 in Edinburg. McALLEN — A doctor who was indicted on healthcare fraud charges was ordered to be detained Tuesday pending trial. Jorge Zamora-Quezada, a rheumatologist who is accused of having defrauded health insurers by billing for treatments based off of misdiagnoses, pleaded not guilty to the charges and was then ordered held without bond by U.S. Magistrate Judge Peter Ormsby. The charges in the seven-count indictment include one count of conspiracy to commit healthcare fraud, five counts of healthcare fraud, and one count of conspiracy to commit money laundering. Before entering the detainment order, Ormsby heard from witnesses who testified to whether Zamora-Quezada posed a flight risk. Defense attorney J.A. Tony Canales presented three witnesses: Victor De La Tore, supervisor for one of Zamora-Quezada’s labs; San Juanita Guerra, a former insurance verifier at his office; and Marelyn Medina, a McAllen urologist who often referred patients to Zamora-Quezada. All three testified that they didn’t believe the doctor would flee given his familial ties to the area and because his businesses were located in Texas. When questioned by the government, they admitted to being unaware of how many bank accounts, cash, properties or relatives he has in Mexico. According to Monday’s indictment, Zamora-Quezada and his co-conspirators allegedly tried to conceal the source of money they made from the scheme by investing in commercial and residential real estate throughout the United States and Mexico. Among the properties were two luxury penthouse apartments in Puerto Vallarta, Mexico; a condominium in Aspen, Colorado; a condominium in San Diego, California; and one in Punta Mita, Mexico. They also used the funds to purchase exotic cars and a private jet which Canales noted Zamora-Quezada agreed to not use. However, Ormsby said that due to the severity of the case and the possible penalties he would face if he were found guilty, he didn’t believe other conditions of supervision would be adequate to ensure he would appear in court. Ormsby called the decision a “close call” which he would be willing to reconsider if new information emerged or if the situation changed. Zamora-Quezada also has the option of appealing the decision. A photo of a doctor who is not Jorge Zamora-Quezada was mistakenly published in an earlier version of this story and has since been removed.